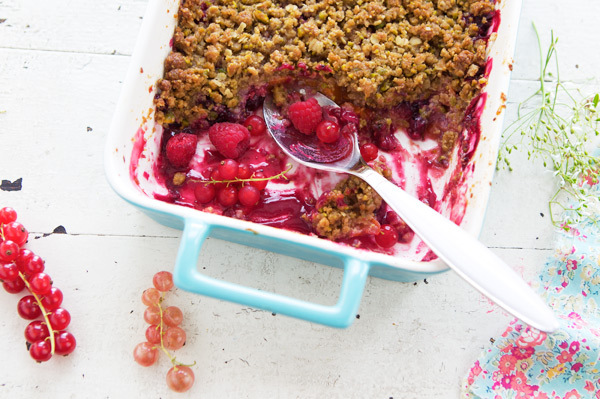 Berry crumble is a serious dessert at home. I have to tell why. I sense that it will even make you feel happy. A few weeks ago, my next door neighbor A. asked if we’d like to go blueberry picking with her. You don’t need to twist my arm, I answered spontaneously. She most likely didn’t know that fruit picking was one of my favorite summer things to do. Not because I’ve gone blue berry picking often. I actually haven’t. In Lorraine, the French region I come from, we grow myrtilles instead. 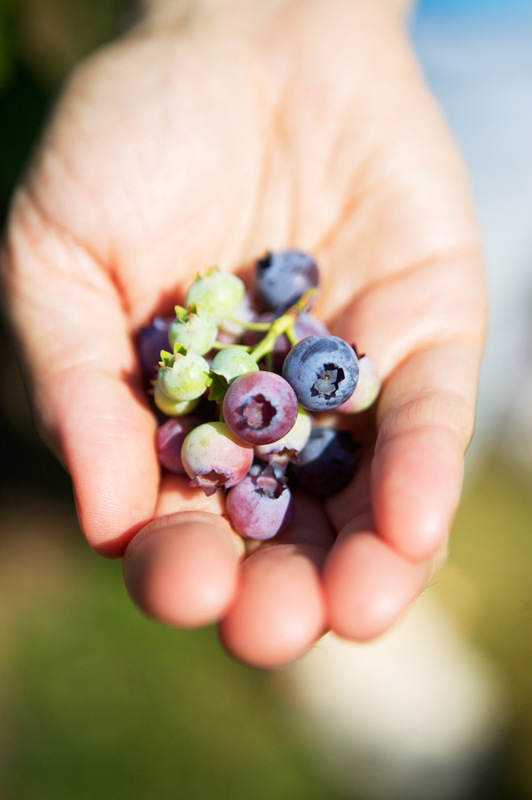 The berries–also called brimbelles–look like their American blue berry cousins but they are much smaller in size. Perhaps darker in color too. In the mountainous Vosges department where the berries are popular, especially for its traditional tarte aux myrtilles, the fruit is harvested with a wooden comb. When I was a child, we’d drive every summer to the neighboring mountains in search of myrtilles. And invariably, we’d return home with baskets full. They ended up in jams and tarts that we enjoyed with whipped cream on the side. The promise of blueberry picking brought me back right there. A. and I made a plan to go the weekend before last. At 7 AM on Sunday, the air was feeling already warm. We knew that the best thing to do would be to arrive at the farm before the midday heat, so we left early. “On va à la ferme cueillir des bleuets ce matin,” (We are going to the farm to harvest blueberries) I told Lulu who was already walking with her red polka dot hat on. 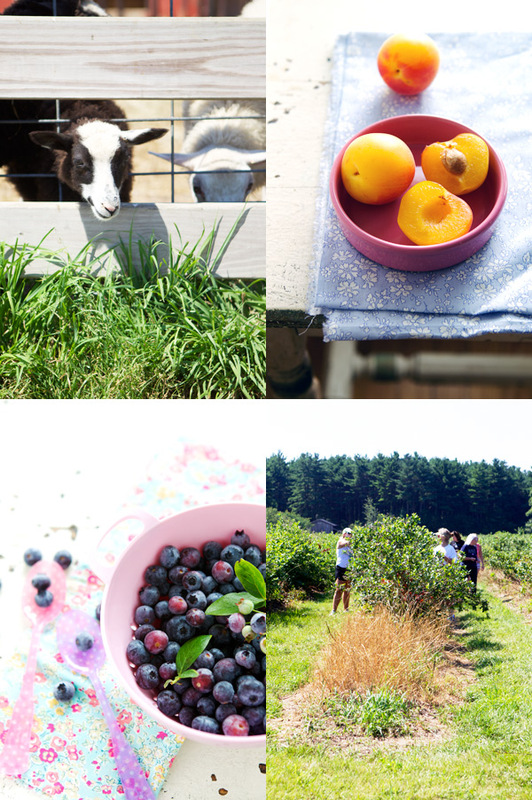 We drove forty five minutes outside of Boston to Ward’s Berry farm. When we arrived, there weren’t many people, which meant that the blueberry field would be mostly ours. Despite the heat that was surely going to peak, it felt like the perfect blueberry day. Everything on the farm smelled like summer. 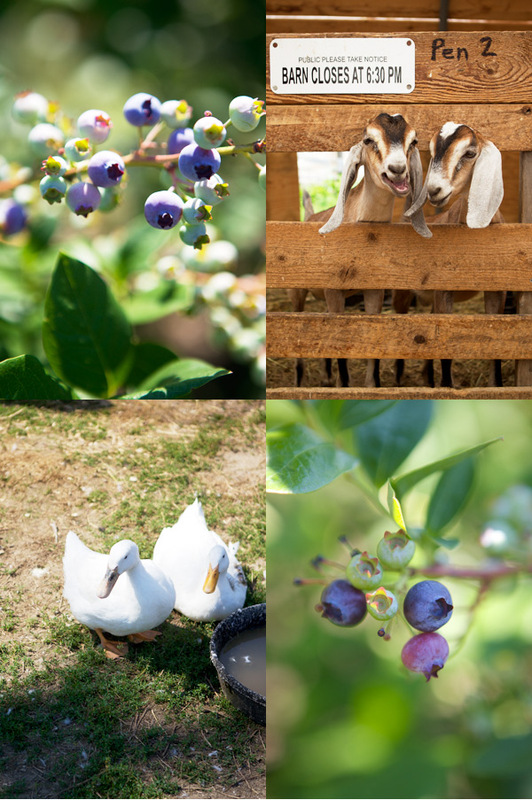 Ward’s Berry Farm is a family run farm that features lovely seasonal fruit and vegetables, flower baskets and plants, deli produce, pick-your-own strawberries, blueberries & pumpkins–and oh so deliciously-cute animals. Behind the farm stand, I was delighted to find geese and pones, baby cows and chicken, baby goats and sheep who enjoyed sticking out their friendly faces to say hello. We were told to follow a narrow dirt road that would eventually lead to the blueberry field. Hearing a few people happily chatting away on the way enveloped me with a feeling that the morning was going to be glorious. 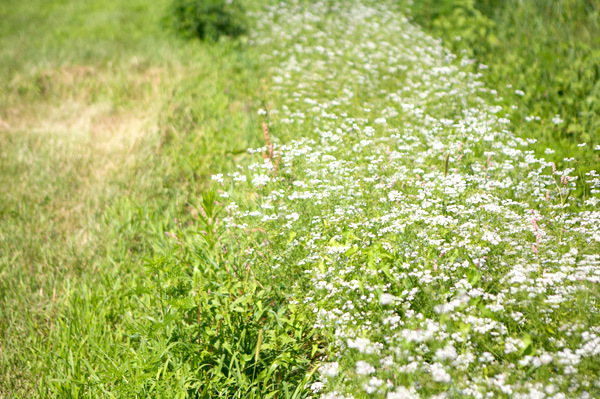 As we walked closer, I noticed long lines of fresh herbs spreading out. There were carrots and salads, raspberries and peach trees–or were they apricots–and I imagined returning just for that reason. I found the berry bushes beautiful. 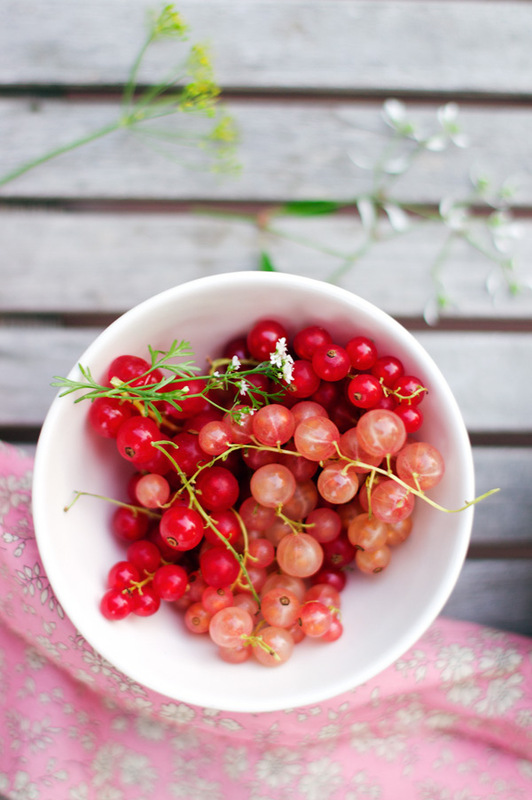 And the berries just like jewels shining under the sun. 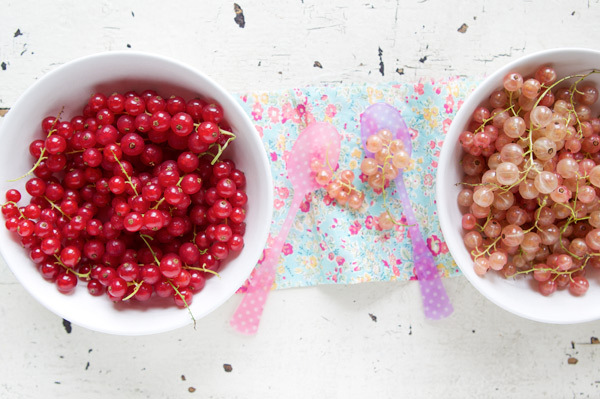 Some berries were pink; others were mauve or blue. Or green. They all mingled harmoniously and looked gorgeous nested between the healthy-looking green leaves of the bushes. It was still early in the season, so we were careful to look for the ripest blueberries, showing Lulu which ones were ready to be harvested. “Another one!” she’d exclaim with joy every time she found a dark-blue looking berry. Clearly she was enjoying our berry-picking game. But as the heat started to seriously peak and she looked tired and more interested in the slide and swings spotted on the way in, we knew that we’d better work fast. So while we did, I kept thinking about the berry crumble that would follow. I ate my first crumble when I traveled to England at the age of twelve. I will never forget. I loved everything about the dessert. Then, crumbles only showed up occasionally during most of my teenager and young adult years. Until I met P. and his Irish family. That was when crumbles seriously entered my life. Every one in P.’s family loves crumble. Rightly so. In their company, I’ve eaten crumbles with rhubarb and strawberries. Some with apple. They taught me to love crumble as much as they do. I love them for that reason too. I wanted a crumble with character. 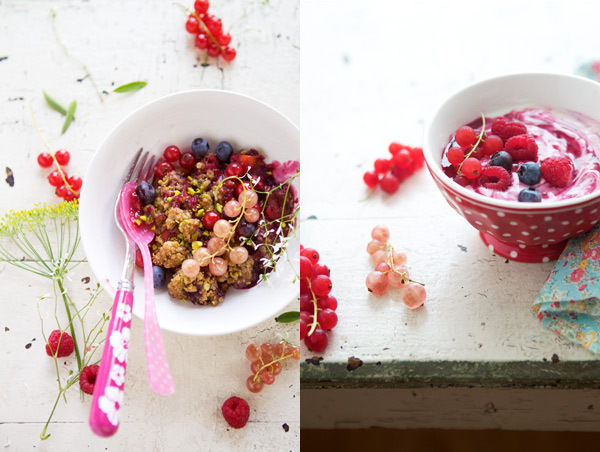 For the fruit, I decided to use juicy apricots, red and white currants, raspberries and blueberries that, I thought, complemented each other really well. For the topping, I chose pistachios and oats and vanilla, and then I tossed in light brown sugar, almond meal, millet and teff flours. While the crumble finished to cook, making the house smell heavenly, I sat down at the table. Waiting until it was ready. It looked like the perfect crumble. Flavorful and crispy. And then I imagined how much I would have loved to share my crumble with every one of P.’s Irish family member. With plain yogurt on the side, just the way I ate mine. I knew they would have also seriously fallen for that crumble recipe. Vraiment, aren’t you glad I told you about it too? I used the rest of my blueberries inside a coulis made with red and white currants. Something I enjoyed in fresh muesli in the morning, or mixed in yogurt and fresh fruit. You can not go wrong with that. And there’s also something else. I am very grateful to the Saveur team for welcoming me in their kitchen when I recently traveled to NYC. And to Babette from Bakespace for inviting me to speak at Techmunch in Boston. It’s always so refreshing to meet people with the same interest in food. To make the crumble: In a bowl, combine the sugar, flours, almond meal, oats and pistachios and vanilla seeds and rub in the butter until crumbles form. Set aside. Butter a baking dish and preheat the oven to 375 F.
In another bowl, combine the berries, apricots, cornstarch and sugar. Let rest for 20 minutes. Pour the fruit inside the dish and cover with the crumble. Bake for 30 minutes, or until the fruit bubbles and the crumble is golden brown in color. Serve lukewarm with plain yogurt or vanilla ice cream on the side. So many memories of my childhood are picking blueberries in New England . . .
That last photograph makes me joyful. We are going to be blog twins this week (see upcoming post), though your crumble is definitely different than my recipe and it is absolutely gorgeous! I have my sights on this farm. 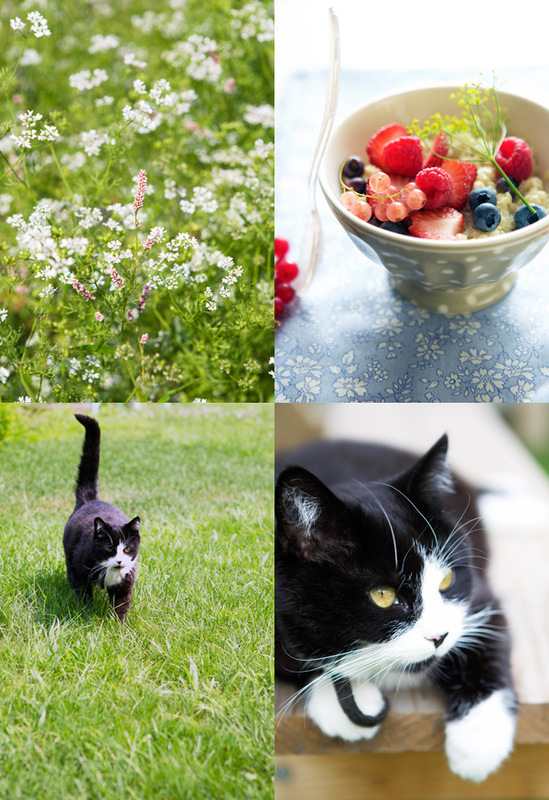 I am always so inspired by your photos–and your darling Lulu! I remember raking native blueberries in Maine when I was a kid with one of those wooden rakes. 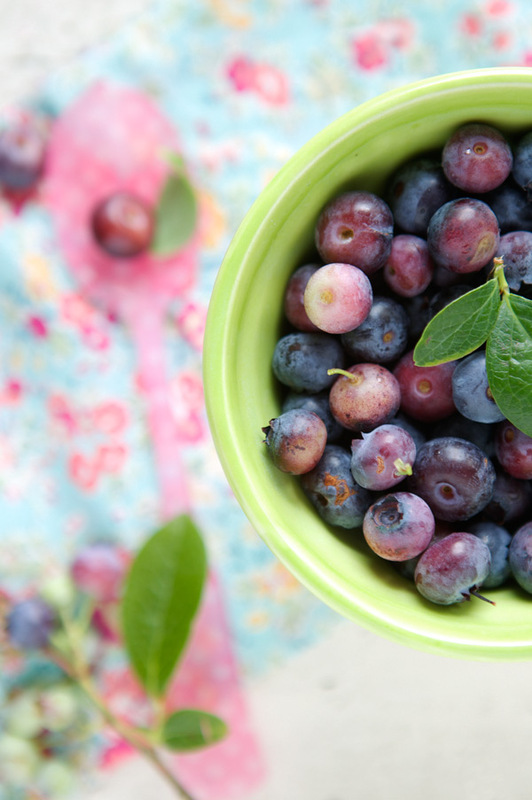 Jams, pies, muffins… love blueberries. Mais qui est ce beau chat?! Il est magnifique! Je crois que je sens le parfum de ce crumble d’ici. Je sais ce que je vais cuisiner ce week-end. En pensant à toi et ta famille irlandaise. Oh oui tu as bien fait de nous raconter!! mniaaam. 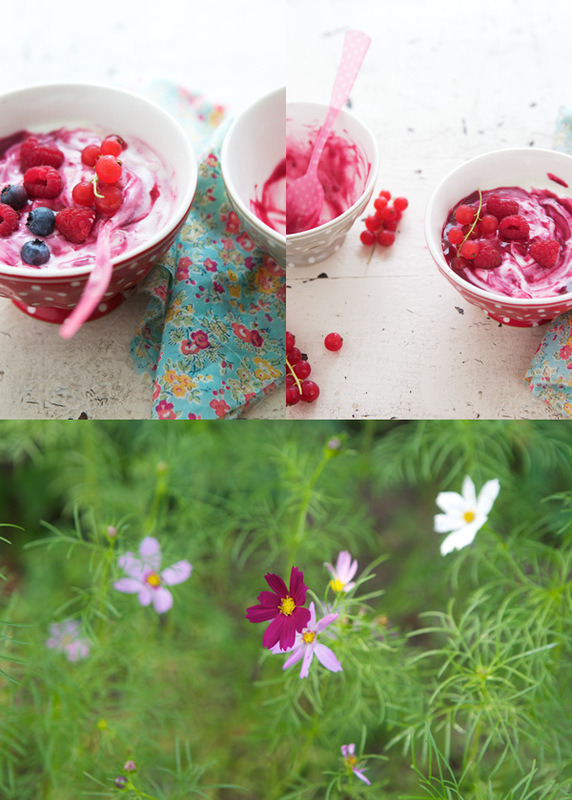 Amazing photos.So sunny and they are quintessence of summer. Wonderful crumble! I was raised on them in England – gooseberries, rhubarb, apple… Here in France, the popular trend is towards savoury crumbles but my upbringing has made it hard for me to appreciate them. Rather like my children with “aspic jelly” because they regularly had sweet English jellies (jello) when young. But generally I’d say bi-cultural children get the best of both worlds!! Wonderful colors ♥ , this crumble must be delicious ! We have a cast iron enameled pan in my family that is stained purple from years and years of blueberry crumbles. Time to deepen its hue. I really like your addition of teff and millet flours. Something to try in my next crumble. You did a great job at Techmunch: I was so happy to see you on the lineup. Your post reminds me I need to get to Ward’s before it’s too late. Happy crumble-eating. I’ve got at least a dozen different crumble berries in my travel notebook. Added them yesterday. Next week I’ll be enjoying a few weeks in a cottage in Sussex and wanted to bake them there for the family. I will definitely bring this recipe too! Gorgeous shots, as always!! Love your blog—I come here for inspiration. 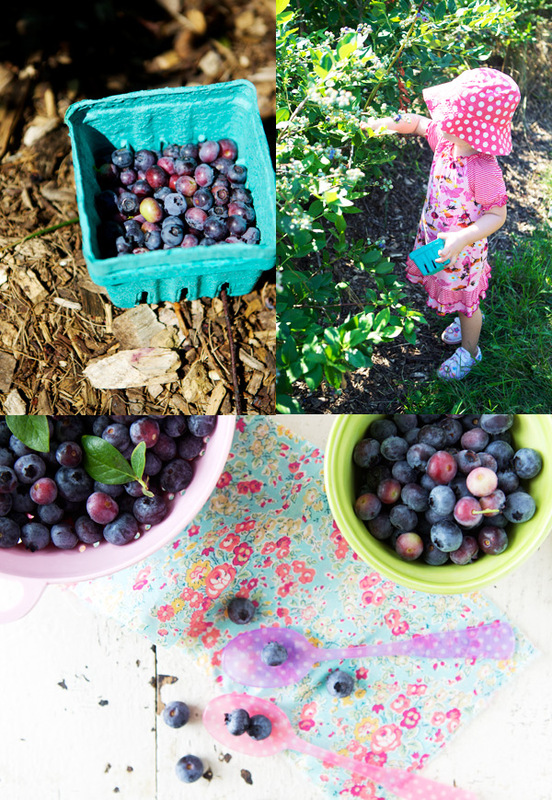 The blueberry picking day sounds/looks wonderful! I love a crumble, and like to add crushed fennel seed to the topping. 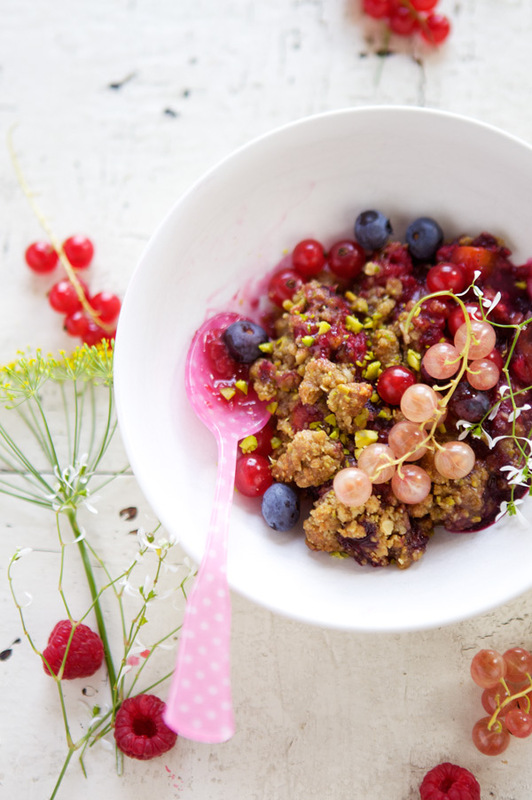 I adored this post from start to finish 🙂 I live in the UK and fruit crumbles are something i have contentedly grown up with, berry picking also is one of my favourite things to do on a lovely summers day but sadly dont get to do it enough! This crumble recipe looks truly gorgeous, i love the nutty addition to the topping 🙂 such a lovely post! Goodness – I just love your blog! Such a sweet retelling and gorgeous photos, too! I made my first crumble recently, but I wasn’t terribly impressed with the crumb topping. I’d love to give your recipe a shot. Thanks, as always, for sharing! Love your stuff. Thank you. Question… can you recommend another thicker to use other than cornstarch? Would tapioca starch work? 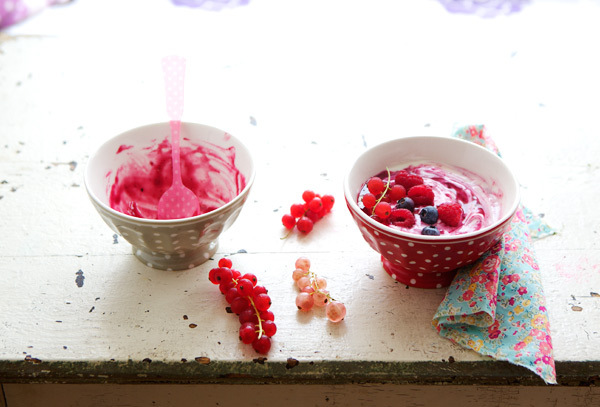 yet another wonderful way of using all the summer’s berries! Thank you so much everyone for your words and thoughts. Lovely, as always, that you also share your own experiences. I love to see what you come up with blueberries too. Keep the ideas coming. Irene, I don’t use tapioca often (I leave the pearls but do not like the flavor of tapioca flour in baked goods, unfortunately). However, I am sure any kind of starch would work. You and Lulu are so lucky to be able to go picking fresh fruits as this time and many more you have! You know, I don’t think those kind of farms exist in my country (Argentina). At least, I’ve never heard of them. I will google it right know! Hope I find something… Cheers! Absolutely gorgeous! You’re posts always make me wistful. Quel délice pour les yeux et les papilles! Les groseilles sont particulièrement belles! Qu’est-ce que c’est, teff, en français? Je ne trouve pas la traduction. Frederique, c’est tout simplement le meme mot. Farine de teff. Ca vient d’Afrique plus precisement. Sooo delicious, I wish I could taste it, really…! 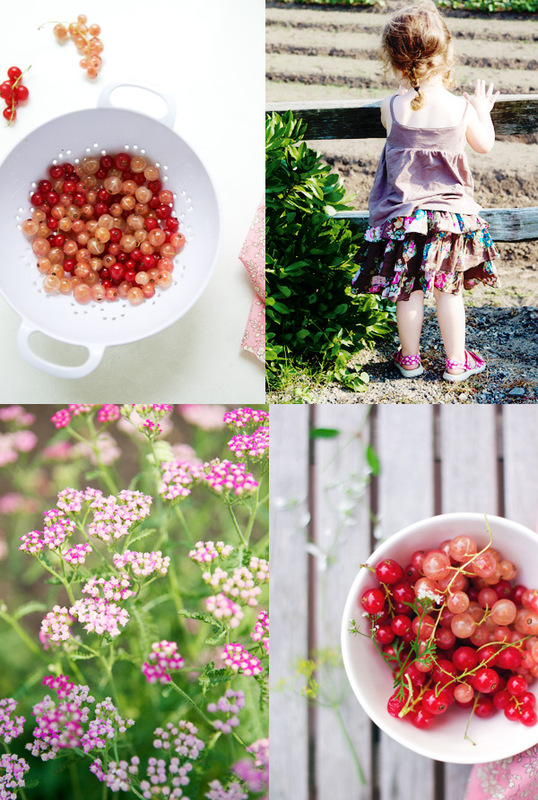 Thank you for sharing your inspiring ideas and photos! Recipe sounds delicious — pictures are beautiful!! où est-ce que tu trouves ici en New England de la farine de millet et de teff ? as-tu la recette en français ?? c’est quoi le muscovado sugar ?? ça a l’air délicieux et les photos sont comme d’habitude magnifiques ! J’aime beaucoup faire la cueillette des fruits l’été. Et le crumble est aussi de rigueur par chez nous. Il est certes beaucoup moins coloré (saison oblige), mais quelque soit la formule, il reste un favori. Ce billet est un vrai régal ! Merci .Je ne vous savais pas Lorraine!!! Quel plaisir vous nous donnez. Une lorraine qui vous adore!!!!! This sounds awesome and your pictures have done your blog proud. I love berry picking and wish we had more choices out here. Blueberries would be wonderful! Crumble has been on my mind lately and your recipe sounds delightful. I have yet to work with millet and teff, this may be a great opportunity. Also, I love the spoons and forks in your photos – where do you get them?? Thanks! I adore Ward’s berry farm! Wen we lived in MA we used to go there every summer for berry picking. We moved this summer and I miss it. It’s such a fun place for kids – I am sure Lulu had a fantastic time! And your crumble looks yummy, of course! 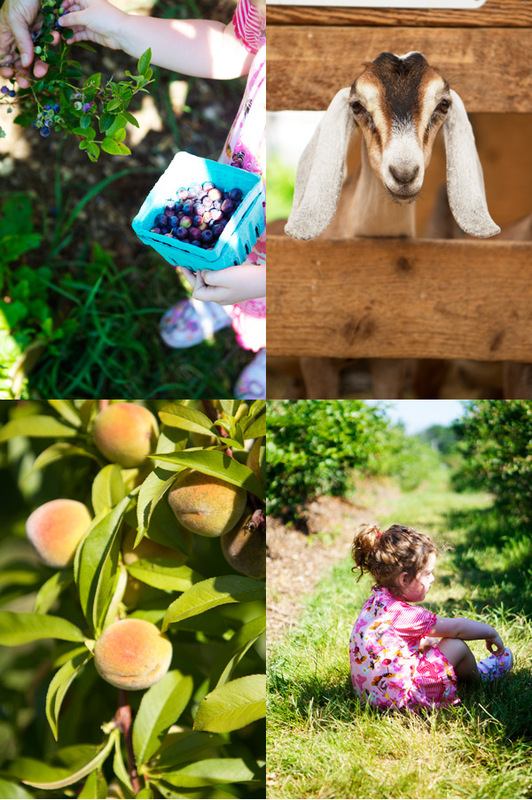 Lucky lucky to have a wonderful farm like this that you can easily visit…picking your own produce is something I would love to do with my own little girl 🙂 Must agree with you on the crumbles…they are indeed great! This one looks so delicious…and I love the flecks of green from the pistachios! Chez Us, thank you! The company is Sabre in Paris. Katie, lovely that you know the farm! Thank you, merci everyone else! Always love to read your thoughts. c’est dommage je n’ai plus vu les recettes en français…j’adore vos photos et vos recettes tout est merveilleux bravo ! I loved your post with such good memories. Your blog is an inspiration for all of us. Best regards from a Portuguese food blogger. When I was ten we went to Finland. There, we went blueberry picking in the woods. It was shady, and the sun did shine through leaves and branches. The ground was covered with blueberries bushes. Mauve, dark blue. That’s what I think about when I eat blueberries. And crumbles, that is one of my favourite desserts, making you feel warm and not alone even if you’re faraway from home missing your dears. Bea, this is the best gluten-free crumble I’ve ever made (and I’ve been a Celiac for almost 10 years). Thank you! Bea I’ve been reading your blog for a while and just now learned you are from Alsace! I lived in Metz for a summer while going to school and absolutely loved it. Now I live in Paris and loving it too. I guess I just love your country and it’s food! beautiful post as usual. This photography is so elegant. Valerie Hoffman made this recipe on ABC News and it was terrific. Her new tv show is coming this Winter-we can’t wait, big fans of hers. Her aunt was the famous Silver Palate cookbook author. 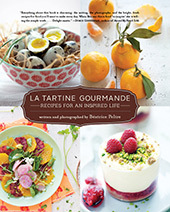 Dear Béa, I would like to send a cookbook gift to my friend in France who is getting married next month. 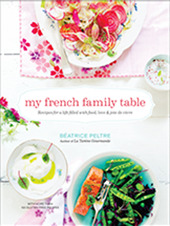 The cookbook needs to be in the French language. Would you have a recommendation for me? Is there a cookbook I am overlooking? My only hesitation: are these classic cookbooks that every single 30-something French person would have in their kitchen? Any suggestion would be appreciated. P.S. I am so happy for you that you have the blessing to live in Boston. We used to live in Belmont, MA. I loved singing in the Tanglewood Festival Chorus (official chorus for BSO and BostonPOPS). I miss shopping at Wilson Farms and going for ice cream in Carlisle at Kimball Farms.